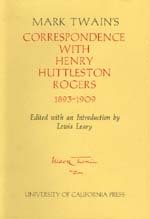 This collection of correspondence between Clemens and Rogers may be thought of as a continuation of Mark Twain's Letters to His Publishers, 1867-1894, edited by Hamlin Hill. It completes the story begun there of Samuel Clemens's business affairs, especially insofar as they concern dealings with publishers; and it documents Clemens's progress from financial disaster, with the Paige typesetter and Webster & Company, to renewed prosperity under the steady, skillful hand of H. H. Rogers. But Clemens’s correspondence with Rogers reveals more than a business relationship. It illuminates a friendship which Clemens came to value above all others, and it suggests a profound change in his patterns of living. He who during the Hartford years had been a devoted family man, content with a discrete circle of intimates, now became again (as he had been during the Nevada and California years) a man among sporting men, enjoying prizefights and professional billiard matches in public, and—in private—long days of poker, gruff jest, and good Scotch whisky aboard Rogers’s magnificent yacht.